In 1974 I had my very first – and very short-lived – university experience. Macquarie University. A few weeks into first term and I’d left. At that time 2 years of supporting yourself meant getting a government allowances to attend university – so full-time work beckoned. Those few weeks were very enjoyable. 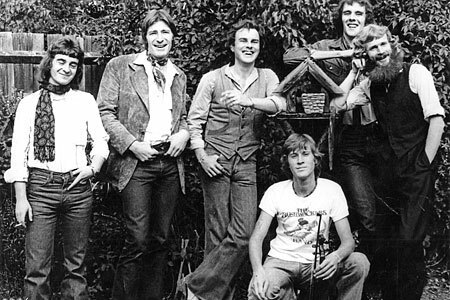 The Bushwackers played on the main lawn – between the library and the administration building. Only a small audience – a few hundred students – witnessed what was a big performance. The following year they released what I thought was their first album … taking its name from the Eric Bogle song And The Band Played Waltzing Matilda. I think the first time I’d heard the song was by The Bushwackers, which is why I’ve chosen their version from that album for this Crossroad. It’s a compelling song, that calls upon some powerful Australian icons – ANZACS, ANZAC Day, Gallipoli, Waltzing Matilda – nevertheless it speaks vividly and emotionally about the horrors of war. 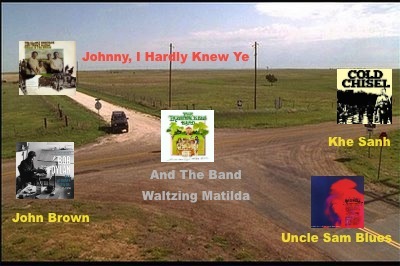 How are And The Band Played Waltzing Matilda and Johnny, I Hardly Knew Ye connected? Both songs are stark and grim pictures of the impact of war. Young men’s bodies have been maimed and their spirit stripped away. You’ll have to be put with a bowl to beg. And I couldn’t sleep for three nights thinkin’ about that song, it was so powerful. – the composer Eric Bogle (with John Munro), performing it some 40 years after he’d written the song. East: Khe Sanh by Cold Chisel. South: Uncle Sam Blues by Hot Tuna. West: John Brown by Bob Dylan. In my parents’ record collection was an album titled Green In The Green, like most of their collection most of the time, it was unlikely to get my attention, let alone my ear. (An illustration of the narrowness of my own mind when I thought I was expansive and my parents narrow – though I always knew they were more liberal than most of their generation). Anyway, one day I looked at the cover and the contrasting images struck me … the clean cut boys in white woollen sweaters against a backdrop of rolling green hills, sitting atop images of violence, protest, upheaval and war. I listened. 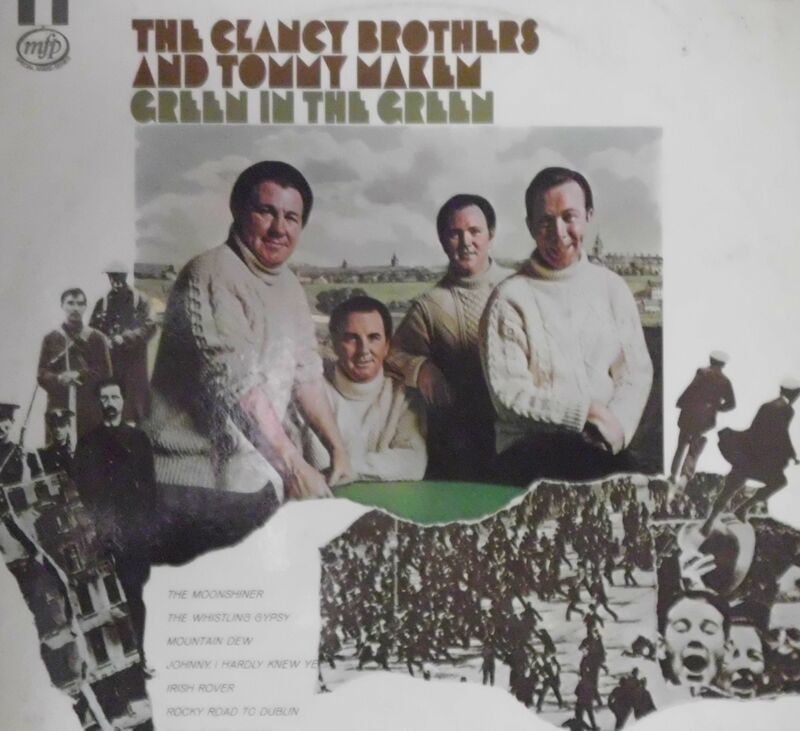 Though enjoying what I was hearing, the songs seemed to be more in accord with green hills & white sweaters than with social unrest & conflict … until track 4 – Johnny, I Hardly Knew Ye – a track recorded live, it showcased the power and passion of these 4 Irish boys. There is clearly a connection between this song and the American Civil War song When Johnny Comes Marching Home Again (which was written by Patrick Gilmore – an Irishman who’d emigrated to the USA). There is considerable contention about which came first. The published dates show that When Johnny Comes Marching Home Again was first published in 1863, while Johnny, I Hardly Knew Ye was first put into print 4 years later. However, a verse of Johnny, I Hardly Knew Ye seems to indicate that it could have been written during the Kandyan Wars which were fought in Sri Lanka (Ceylon – Sulloon) between 1803 and 1818. Adding credence to this, apparently a large number of troops were recruited from Athy in County Kildare to go to the Kingdom of Kandy. The first line in the song places the singer along the road to sweet Athy. How does Johnny, I Hardly Knew Ye connect with The Partisan? War! Albeit from a different voice. Unfortunately, the sound on this clip is not great … it is from a TV program that looks like it has American history as its focus. The introduction by the host is an interesting perspective and seems to be somewhat at odds with the anti-war sentiment of the song. Also unfortunately I could not find the same version as I have on vinyl (and I don’t have the equipment to convert from vinyl to digital). * The Story of Tommy Makem & The Clancy Brothers (1984) (55m 52s) – a good little documentary that uses their reunion concert at the Lincoln Center, New York as launching pad for a look into their history. Some comments from Bob Dylan, Mary Travers, Tom Paxton and others. East: The Partisan was the last stop. 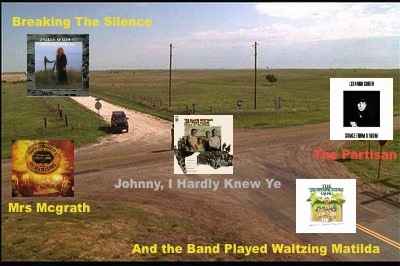 South: And The Band Played Waltzing Matilda by The Bushwackers. West: Mrs McGrath by Bruce Springsteen.